Adjustable footrest increases comfort by placing you in an ergonomically correct position to avoid back, neck and leg strain and fatigue, which can lead to pain and discomfort. Use your feet to control the tilt angle adjustment from 20 degrees to negative 20 degrees on the platform. Manually adjust the height adjustment to 4 or 4 34. 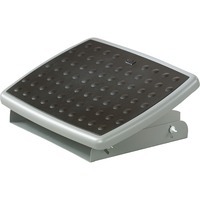 Adjustable footrest also features a nonskid foot platform with soft bumps to massage and soothe your feet. Durable, heavy duty steel base stays in place.